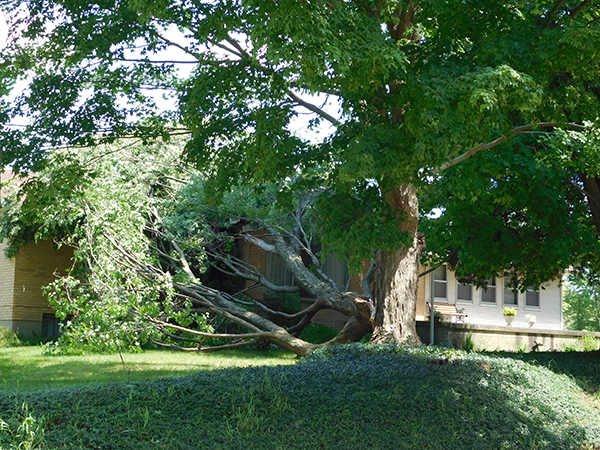 A portion of this tree fell on a house on 17 Mile Rd, west of Algoma, during a storm Sunday, July 1. Post photo by J. Reed. A storm blew through the area on Sunday, July 1, leaving some 31,000 customers across the state of Michigan were without power, with Kent County the hardest hit. Over 14,000 people in Kent County without power. Many were located right here in Cedar Springs, and some did not receive power again until sometime Tuesday. Downed trees were a common sight, including the one pictured above at a home in Solon Township, just west of Algoma and 17 Mile Rd.